One of our best amenities is our lighted, covered boat dock, which is located about 200 yards from the end of our driveway along the paved Howard Creek Road. The dock has a fish cleaning station with a manual water pump, electric outlets for each slip, and lights at night. It is situated in a small cove, protected from strong wakes and winds, beside the public boat launch for the Howard Creek Access area of Bull Shoals Lake. There is ample parking here, and launching your boat is easy. A slip for your boat . . . When you rent a cottage at our resort, you are entitled to use a boat slip for your boat. Our dock has 6 double slips, 18 feet wide each. Some larger boats may require both halves of the double slip, while most smaller fishing boats and personal water craft can manage with a single slip. Whatever the case, we will find a convenient and secure place for your boat. 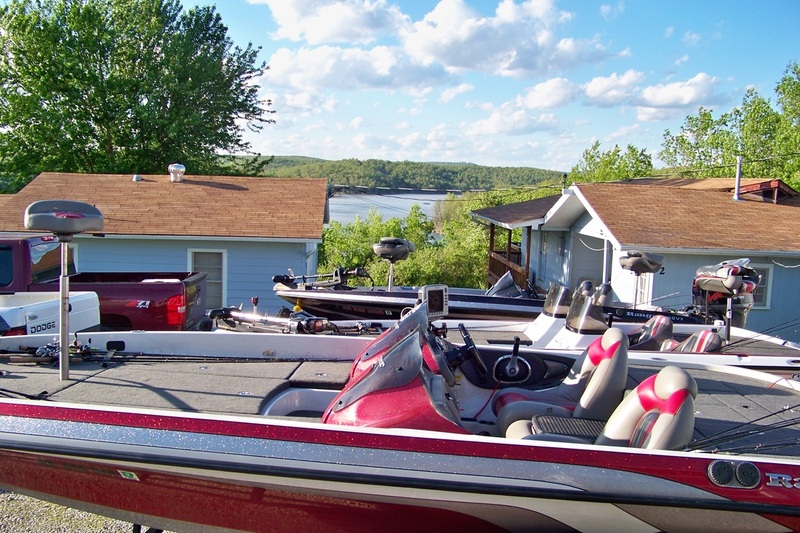 We have several dedicated areas for you to store your boat trailer, as well. And tournament competitors can easily trailer and charge their boats on the resort property on the night before the big event!
. . . in our modern dock! A view of the dock as you come in from the lake. Some Tyson competitors' boats outside our kitchen window!
. . . or rent ours! Our 2006 Smokercraft 20' pleasure pontoon, with 75 HP 4-stroke motor and fish finder, is available for rent by the half-day, full day, or week. It has a bimini top, swim ladder and lots of storage. Roomy and plush, our Smokercraft is top of the line! Satisfied guest on a pontoon, cruising and sightseeing along the summer lakeshore. Notice the happy smile, sunglasses and long sleeves -- all are required equipment when renting one of our reliable watercraft. For value and efficiency, you can't go wrong renting our Lil' Blue 16' fishing boat with the 25 HP Mercury motor. Tried and true, Lil' Blue delivers reliability, maneuverability and fun for up to three people who want to fish, see the sights, or simply cruise the lake. Our dandy little fishing boat. She's small but satisfying, stable in all conditions and easy to handle. We also have a trolling motor and battery you can rent to complete your fishing experience. We'll be happy to reserve a boat for you when you make your lodging reservation, and require a deposit to hold the order. You must be 21 years or older and possess a valid drivers license to rent a boat. It's a good idea to reserve your boat at the time you call for lodging, especially in the summer months. When you are ready to take the boat out, we will go over the operating and safety features with you. We will do the refueling or you may purchase fuel from an area marina. 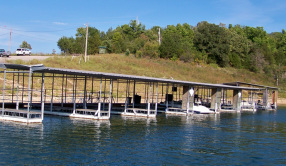 Ridgecrest boat rentals are available only to paying guests of the resort.